From people using water in kitchens and bathrooms in their homes and from commercial and industrial use. Nearly half the state's population, over 2 million people in 43 communities, send sewage to MWRA's treatment plants on the shores of Boston Harbor. Over 5,500 businesses and industries contribute wastewater as well. In addition, nearly half of the total flow in MWRA sewers is from rainy-weather street runoff and from below-ground cracks and faulty connections that allow groundwater into the system. Sewage travels through three different sets of pipes. Water that is used in a home or industry is flushed through a building's pipes until it reaches local sewers which are owned and operated by city and town sewer departments. These 5,100 miles of local sewers transport the wastewater into 227 miles of MWRA interceptor sewers. The interceptor sewers, ranging from 8 inches to 11 feet in diameter, carry the region's wastewater to two MWRA treatment plants. Though most of the wastewater flows by gravity some low-lying areas require pumping. Sewage is piped from communities to several headworks where bricks, logs and other large objects are screened out. Pumps draw the sewage through deep-rock tunnels under the harbor to Deer Island. The remaining wastewater is disinfected before it is discharged to the receiving waters (Massachusetts Bay). This stream of treated wastewater, known as effluent, travels through a 9.5-mile Outfall Tunnel bored through solid rock more than 250 feet below the ocean floor. The tunnel's last mile and a quarter include 55 separate release points known as "diffusers." By extending to an area with water depths up to 120 feet, this outfall provides a much higher rate of mixing and/or dilution than is possible with present discharges into the shallow waters of Boston Harbor. AREN'T TOXIC CHEMICALS A PROBLEM? Yes. If excessive levels of toxic chemicals are allowed to enter the system, they could either prevent the safe application of sludge as fertilizer or threaten the marine environment if discharged to ocean waters. New regulations have been written by the MWRA to control the amount of toxic chemicals that companies can discharge into the sewer system. 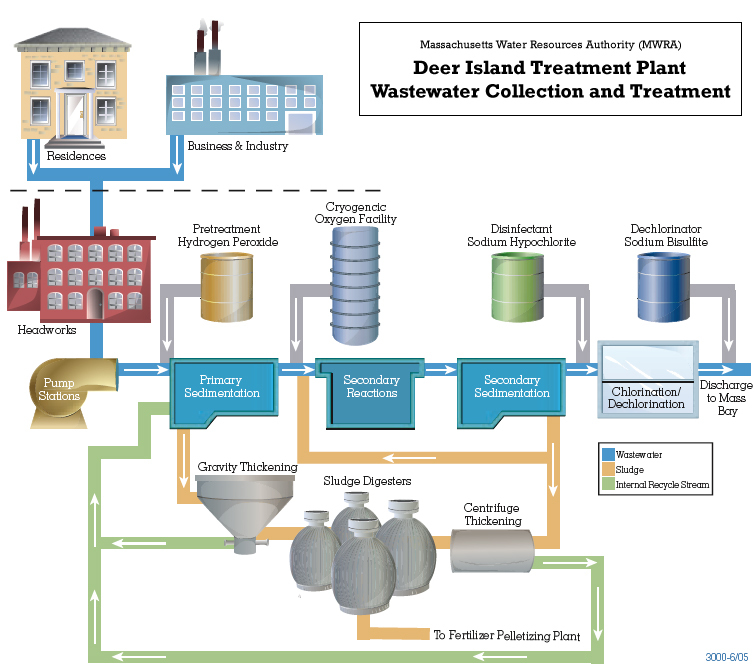 The MWRA's Toxic Reduction and Control Department is responsible for monitoring and enforcing the regulations and imposes fines against industrial polluters. The MWRA also works with industries to encourage reductions in the use of toxic chemicals that might be discharged into the sewer system. Households are also an important source of toxic chemicals due to the careless dumping of toxic products down household drains. Used motor oil, pesticides, paints, solvents and even many household cleaners pose significant hazards to the environment. For most household jobs, less toxic alternatives are available.